Brenda K Wiederhold: I am here today at the European Commission in Brussels, Belgium with Mr. Robert Madelin. Thank you for this opportunity Mr. Madelin. You were appointed this year to a new position in the Commission. Can you tell me what position that is please? 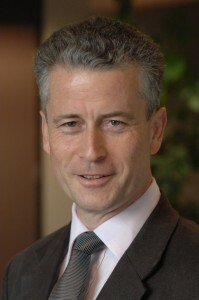 Robert Madelin: Yes, I was appointed in April 2010 as the Director General for the Information Society, which means that I coordinate that part of the Commission’s work that deals basically with research in ICT and policymaking and regulatory interventions across the range of electronic communications and audiovisual media. BKW: Excellent. I want to ask you some more about your current position, but first I want to take a step back and read you something I found about your previous position and let you comment on that. It was said of you “Madelin had transformed the way the Health and Consumers Directorate was run. He took risks and established what he called cooperative voluntarism as the new way of doing things, getting stakeholders to sit around a table and sign up to voluntary commitments as an alternative to legislation.” Can you speak to that please? RM: Well I think that it’s a bit too flattering in the sense that the conception of having cooperative voluntarism is something that been around both in Europe and I think in many parts of the world, as an efficient alternative to some previous state interventions. So I wouldn’t say I invented anything. Butthis past decade in Europe has been a good time to run such experiments and in particular in 2004, ‘05, ’06 where we were looking at issues like controlling the advertising of high-fat-salt-sugar food to children, promoting physical activity, encouraging a reduction of harmful use of alcohol. All these issues turned out to be very good candidates for multi-stakeholder interventions and at the same time the different stakeholders both in civil society, health professions and the corporate sector were ready to try. BKW: So right time, right place?RM: Yes.BKW: And in your current position? What do you see as some of the things that you want to accomplish?RM: Well in a sense I am lucky because I come to this job at the time that the new Commission has adopted a “Digital Agenda for Europe”, which really covers the whole set of issues where this part of the Commission should be active. Getting the research protocols right for the next ten, fifteen years is a big piece of the discussion in the current oncoming years and similarly implementing better the regulatory frameworks so that the internet can really take off in Europe like everywhere else as a good basis for helping citizens to have more of what they want to have better lives. BKW: And had you always been in the field of healthcare legislation policy? RM: No, not at all. I started as a public servant at the end of the 1970’s in London, and I began spending about twenty, twenty-five years doing international economic relations. So with the World Trade Organization negotiations for example. I came to health in 2003, 2004 but at that time I found I had actually done already quite a lot of around health regulatory issues, both with health services in the context of the trade negotiations and on food-chain regulation also from the trade perspective. So it was a bit like moving up the value chain instead of dealing with the consequences of regulation being responsible for it. BKW: What would you consider to be the ICT for health’s main achievements in 2010 and what are the priorities looking beyond? RM: I think in 2010 one of the main achievements that we have had is a policy achievement rather than a research breakthrough, which is to get agreement across the college of Commissioners, the Parliament and all Member States to a new form of partnership. What we are going to develop is a European Innovation Partnership where you take the people who are working around health as an issue, the ICT and research actors but also member stategovernments, regional authorities, health insurers, civil society and we try to bring ICT benefits for health more quickly to the individual citizen. I see that as quite an interesting breakthrough with parallels to my past life. BKW: Quite a big endeavor. What do you see as some of the biggest obstacles facing the implementation of ICT in Europe? RM: Specifically in the health field, it’s clear that developing a trustable solution to privacy problems is essential, both for the individual patient and for the individual health professional. The second challenge I think more on the side of the professionals is to make it clear that ICT makes life easier. If it just looks like another set of tools to learn and yet more folders to fill in, then health professionals may very rapidly reject innovation. So I think overcoming both obstacles to adoption by health professionals and obstacles to trust on the part of the patients are the twin obstacles to more rapid rollout. BKW: C&R is focused on behavioral healthcare. We were talking earlier about this. Can you speak to me about some of the Commission’s priorities in behavioral healthcare? RM: I think that behavioral healthcare is the area in Europe where there is the most health gain to be made. In most developed countries infectious diseases and pandemics continue to be a threat: let’s not forget TB, for example. But what’s really killing us Europeans is the way we live. Therefore the huge gain to be made comes from help with behavioral issues, whether it’s more responsible use of nutrition or alcohol, smoking cessation, mental health management. These are issues where people need day to day help so that they can take charge and yet health-professional help is constrained. There aren’t enough experts to go around. So using ICT to make behavioral help available in a private, non-stigmatizing, autonomous way for individuals would be a huge bridge between almost infinite additional need and very constrained resources. It’s a very exciting area because some of the ICT solutions can be relatively low tech. BKW: If you had to choose one thing that you were most proud of in your career what would that be? RM: Can I choose two? I mean I think there was a day or two in 1993 when I think I made some contribution to finishing the”Uruguay Round” of global trade negotiations. It was very important at the time to create a more open platform for growth everywhere including in developing countries. And then from my time in the health field, I would pick the creation in 2005 of the first multi-stakeholder platform to promote better nutrition and reformulation of processed food and physical activity, which after five years has got a positive health check this year from the evaluators. In my current job I haven’t been here long enough to achieve something. BKW: And what do you want to accomplish then? RM: In a job such as this I have a five, six-year mandate. I think in that time delivering really on the goals we have now set for ourselves in the digital agenda would be huge. The challenge that I think is very important is, in a way our slogan, is “enabling every European to be digital”. Not forcing them but enabling them. Thirty percent of European citizens have not yet ever gone online, and in some countries it’s more like half or more than half, and in some poorer communities in some member states of the union it may be seventy five percent. So we are looking at a huge disparity across Europe and if we can level up so that every European citizen has that opportunity and doesn’t just go online to sort of do superficial things but finds the tools for better health, for better government service, for better community life, then I think we can begin to have made a difference. BKW: And how long do you think that will take? RM: Well if you look at a country like the United Kingdom they are aiming by 2012 to have got everybody online. So it doesn’t take so long if you can stretch out and find all the people in the communities and in all peoples’ homes, in workplace settings, in apprenticeship colleges and work with that; you can’t do it from the top down. But many different member states in Europe are trying to pursue this in the ways that work in their community. In Poland they are using the rural public libraries and in Malta they are using the prison serviceand apprentice colleges. So I think that helping the different member states to do more of that is really the way forward. BKW: What gets you up every morning? What is your passion, your true passion? RM: I believe that the job I do, the professional pursuit of the public good is a very big challenge. It’s an even bigger challenge at a time of budget austerity and societal transformation and that gets me out of bed. BKW: And can you say a bit about EU-US cooperation? RM: Yes, so on the international front, on research, for example,we want the best ideas and the best research from across the world. So we have taken a very open stance to partnering on the research end of our work with institutions and individuals from wherever. Equally I think the EU-US relationship around policy and regulation is also a very strong one and in the area of healthcare, health promotion and so called eHealth there is a long tradition of dialogue. This year we are signing with the US Administration a new protocol to work together on eHealth, particularly ICT in healthcare settings. But my personal belief is that our partnerships can go much more broadly than that and to issues of behavioral health promotion and assistance to citizens. There is already some tradition of working together around subjects such as nutrition and physical activity but we haven’t yet built in the ICT components of this work to do that as well.